Launched in April 2012, the procedure workflow system is a major new addition to our CollectionsIndex+ product. It allows configurable workflows to be defined that can lead the user step by step through sophisticated procedures for carrying out the daily tasks of managing your collection such as Acquisition, Loans and Rights Management. This system underpins the V&A's award-winning collections practice mission to improve its management processes. A procedure is defined as a series of steps, each of which can perform various types of task. Each step may be dependent on the completion of other steps and/or the answers given during the execution of those steps. Users will be guided through the series of steps currently available to them. User roles can be configured to determine who is authorised to carry out certain steps. Steps requiring particular roles may be assigned to appropriate users. You may be notified of steps assigned to you by email and they are also clearly displayed on your CollectionsIndex+ home page. When a step is completed the system automatically records who completed that step and when. Milestones which can be used to update the current status of the procedure record and its associated items. Freezing of steps once certain milestones are reached to prevent subsequent alteration of previously entered information. 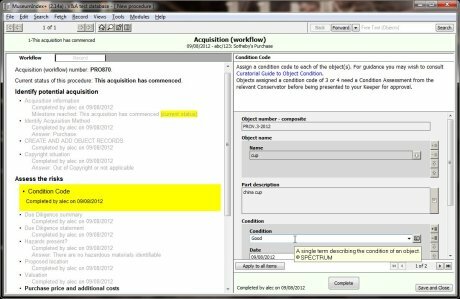 Automatic assignment of fields in the procedure to constant values, results of expressions based on previously entered data, specially generated values such as temporary object numbers, etc.